The burgeoning "theological interpretation of Scripture" movement has gained much notoriety, but it has yet to demonstrate consistently that dogmatic reflection both aids and flows from exegesis of biblical texts. This volume includes essays on critical passages related to a number of key doctrinal loci (e.g., Genesis 1, Exodus 3, Proverbs 8, John 1). It also intentionally offers examples of theological commentary on various genres of Scripture (on biblical narrative, poetry, wisdom, gospels, and epistles), showing how the whole Bible can be read theologically for the church. Students and scholars alike will find compelling examples of theological commentary ranging across the canon and roaming about the theological confession. The volume includes essays by notable scholars conversing with the canon, the creed, and our contemporary culture: including Kevin Vanhoozer, Michael Horton, Henri Blocher, R. W. L. Moberly, and D. A. Carson. R. Michael Allen (PhD, Wheaton College) is Kennedy Associate Professor of Systematic Theology and dean of the faculty at Knox Theological Seminary in Fort Lauderdale, Florida. He is the author of several books, including "Karl Barth's Church Dogmatics: An Introduction and Reader", "Reformed Theology", and "The Christ's Faith: A Dogmatic Account". He also serves as book review editor for the" International Journal of Systematic Theology" and is ordained in the Evangelical Presbyterian Church. 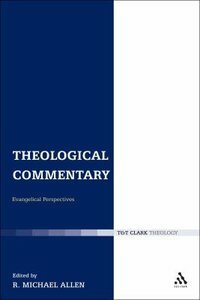 Editorial Introduction What Is Theological Commentary? ; Kevin Vanhoozer Jeremiah 31; A. T. B. Mcgowan Colossians 3:1-4; Daniel Treier Philippians 2:1-11; Scott Swain Mark 12:35-37; Michael Allen Exodus 3; Geoffrey M. Ziegler John 8:31-38; Ryan Peterson Genesis 1:26-31; We Have Asked Barry Webb To Contribute A Chapter. Kelly Kapic Is Strongly Inclined To Participate. We Also Intend To Ask Others To Participate Once We Are Under Contract; Thus, We Hope That Stephen Holmes, R. W. L. Moberly, D. A. Carson, And Bruce Mccormack Will Agree To Contribute Chapters.